No gemstone is more creatively striped by nature than agate. This distinct and dramatically banded variety of chalcedony is composed of quartz layers. This composition varies greatly and can be of many colors. The other chalcedony family, jasper, has less-regular patterns and is less defined than the agates. Another difference between the two is that agates tend to be translucent, while jaspers are generally opaque. This distinction stems from agate being composed of microscopic "fibers" of crystalline quartz while jasper is made of microscopic "grains" of crystalline quartz. Agate is a beautiful ornamental gemstone with a variety of colors, uses, and designs. Agate is very fine grained, allowing for polished agate to be exceptionally smooth and bright. Because of how agate is formed, it can produce a variety of colors such as moss agate, dream agate, Indian agate, and red agate. 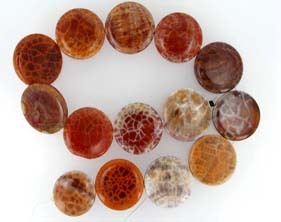 Agate beads and pendants are a banded and or multi-colored member of the quartz family. The characteristic bands of color are caused by the presence of iron and manganese. Agate, one of the oldest known gems has been valued for thousands of years. The most popular types of agate include blue lace agate and moss agate. Agate is reputed to aid insomnia and sweet dreams. Other members of the quartz family include jasper, carnelian and onyx. One of the most plentiful and varied stones on Earth, Agate is found in nearly every color in the rainbow and ranges from translucent to completely opaque. This beautiful stone belongs to the Chalcedony family, and is a relative of Aventurine and Carnelian. Opaque Agate is called Jasper. Agate can be found in many shapes as it is easy to cut and polish. We have a variety of Agate, including red and black striped Botswana Agate, patterned orange Crab Agate, dappled green Moss Agate, and many more. Order wholesale Agate Gemstone online now right here on FinalFinishJewelry, or give us a call at +91-141-5170277 for more information.